Below I will explain these and some other characteristics. You can see that it is very compact and light. 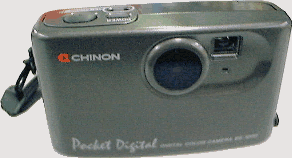 In addition, unlike many other digital cameras that use several AA-batteries, ES-1000 runs on a single lithium battery called CR123 which weigh only 16g (= 0.6oz); so its weight including battery does not differ much from that of a single-use camera. The list price of ES-1000 in Japan is 39,800Yen (about US$300). Its street price has been 10,000-20,000Yen as of early 1997, but currently it is hard to find. DC-20 is sometimes liquidated at less than 10,000Yen. According to the catalogue, the image resolution of ES-1000 is 493x383 pixels in fine mode. In fact, its pictures look so good that their quality is often evaluated in magazine articles as being above that of other cameras on the same price range or even near to that of 640x480 products. However, resolution of raw images that are transferred from ES-1000 to PC or Mac is 512x243 pixels (each pixel consists of 8 bits) and not 493x373. The driver software seems to remove several invalid pixels on the top/bottom/left/right borders, and to perform vertical interpolations to produce 493x373 images. I suppose that the reason why images are good enough after this interpolation is that it doesn't compress images using JPEG (as many other cameras do) but sends raw CCD data for image processing on PC or Mac. which is indeed too few. To cope with this shortcomings, an option called memory card holder is available. It is small and light but doesn't accept standard ATA flash cards (only AIMS flash cards for digital cameras can be used on them). Alternatively, you can immediately transfer pictures if you take a notebook PC with you. However, the driver software that comes with ES-1000 works only on Windows 3.1/95 or Mac. I wish I could use it on my handy HP200LX! ... that is what I have been wishing. If you have the same wish, you should try a software called LXDC by Eiichiroh Itoh. It is explained in detail on the separate page here. Besides LXDC, there is a DOS command line program called MCH by NAKAMURA Takahiro. ES-1000 has no flash, but images taken in a dim place such as restaurants look not too bad (though their colour may become somewhat inaccurate). You may also try Flash Kit for DC-20 (I am not sure if it can be used with ES-1000). Focus is not AF but pan focus from 0.5m to infinity. Practically you can take pictures if you are at least 30cm (= 1ft) away from the subject. As LCD display is not available, you have to use the optical finder whose parallax is fairly big; you should deliberately shift the composition if your subject is less than 2m (= 2yd) away. The form of each button is unique enough to avoid misoperation. Number of remaining pictures you can record is shown by number of blinks. Magazine articles say that this method is difficult to understand, but I was quickly used to it. The catalogue specs of ES-1000 and Kodak DC-20 are exactly the same. Their external appearances are also common except their colour and logo. The only difference currently known to us is a code transmitted during communication that is supposed to be product ID; they seem to be at least highly compatible including their firmware. However, software that come with them are very different. The driver of ES-1000 has a capability to store raw images transferred from ES-1000 to files in so-called CMT format and to read them later to convert it to other image formats. Size of a CMT file is 122KB, which makes it convenient for saving original images in uncompressed form. DC-20 software cannot handle this CMT file, but instead it includes application software to make cards, calendars or slide shows. The official ES-1000 driver distributed online by Chinon used to work with DC-20, but I have received several disappointing reports that current version does not work correctly with DC-20. 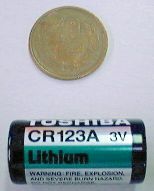 CR123 and a 10Yen coin ES-1000 uses a lithium battery called CR123 (or DL123A), which is light as stated above and easy to find becase it is commonly used in cameras. I was able to take and transfer around 100 pictures with one CR123. The price however is slightly too high (480-800Yen in Japan). The list price of the optional AC adapter for ES-1000 is 4,500Yen, which is high enough for tempting people to conspire soldering a junk AC adapter to an appropriate connector. However, as one can immediately notice, ES-1000 has no jack for AC adapters --- to use the official AC adapter, you have to remove the battery and to insert a connector which has the shape of a CR123 battery; you would better continue buying CR123s. Pictures on this page is taken using Fujifilm DS-7 (as I don't have two ES-1000s :-)).